This name is of English locational origin from two places in Derbyshire called Kirk Hallam and West Hallam. The former placename is recorded in 'The Book of Fees' (1242) as Kirkehalum and the latter as Westhalum in the 1230 Pipe Rolls of that county. The name derives from the Old English pre 7th Century 'halum' or 'halh' meaning a 'nook' or 'remote valley'. Hallam is also the name of a region around Sheffield in Yorkshire. This district, sometimes called Hallamshire, derives its name from this source and is first recorded towards the end of the 13th Century. 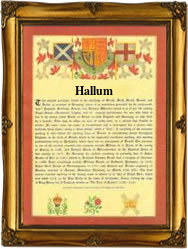 In the modern idiom the name has three spelling variations: Hallam, Hallum and Hallums. On August 1st 1593, Margaret, daughter of John Hallam, was christened at St. Mary, Whitechapel, Stepney; Katherine Hallam married Thomas Barker, on June 3rd 1607 at st. Bride's, Fleet Street, and on April 10th 1611, Anne Hallam married Richard Manesfield, at St. Giles, Cripplegate, London. The first recorded spelling of the family name is shown to be that of Adam de Hallum, which was dated 1297, in the Pipe Rolls of Yorkshire, during the reign of King Edward 1, known as 'The Hammer of the Scots', 1272-1307. Surnames became necessary when governments introduced personal taxation. In England this was known as Poll Tax. Throughout the centuries, surnames in every country have continued to "develop" often leading to astonishing variants of the original spelling.